The weaver's shuttle and the sprigs of flax are symbolic of the linen industry. The ostrich head with the horseshoe on its beak are from the arms of Sir Richard Wallace and refer to his fame as a collector. The gamecock is a punning reference to the old name of the town� Lisnagarvey, the fort of the gamesters. With a population of around 83,000 the Borough of Lisburn is one of the fastest growing areas in Northern Ireland. In its present form the Borough dates from the local government reorganisation that took place in 1973. In that year the former Lisburn Borough (which had been an Urban District from 1899 to 1964 and a Borough from then on) was abolished and replaced by the new and larger authority which extends beyond Lisburn itself to include numerous other towns and villages�including Moira, Dromara, Glenavy, Dunmurry and Hillsborough. Northern Ireland's story goes back many thousands of years and the landscape of Ulster today has been moulded through that time, the thickly forested and lake strewn country of earliest times having given way to well farmed land and the smooth hills of today. Ever since the time, over four thousand years ago, that Irish men began to till the land, changes have been a continuous process although, it has to be admitted, not all have proved to be for the better. During the last millennium B.C. successive invasions brought a Celtic culture and language to the shores of Ireland and, although not completed until the early years of Christianity, this process eventually saw a Celtic hierarchy established throughout the country. From about 300 B.C. onwards man began to adopt iron cutting tools and these allowed him to adjust to his environment. Cattle rearing became a major occupation and the need to protect himself against raiders also became an important factor in everyday life. Indeed protection was needed not only against raiders but against packs of wolves which roamed the countryside. This helps to explain the many earth or stone-ringed farmsteads (raths and cashels) which are still found in the fields. These constructions belonged to the more important farmers who were, in all probability, descended from the Celts. The Gaelic way of life was a pastoral one and had no need of urban centres. Even by 1600 the only places with urban pretensions were such small post towns as Ardglass and Carrickfergus, places founded by the Normans. The 17th century, however, brought the plantations which were concerned with the setting up of market towns. These, although small, became centres of ad-ministration and influence and their markets and fairs became regular features of local life. These new towns helped the Ulster plantation to success and they became the main instruments through which was built up an awareness of the Protestant tradition of the English and Scots. The period of independence, from 1782 to 1800, was a period of prosperity for both landlords and the people of the towns. Much money was spent on roads and new 'public works'; the market towns grew and, in many cases, were replanned. Some wholly new towns, with their wide main streets, were built. In most Ulster towns the oldest houses and inns date from these years at the end of the 18th century. Pre-Georgian secular buildings are almost non-existent. Many farmhouses and country mansions were built or reconstructed at or just after this period. 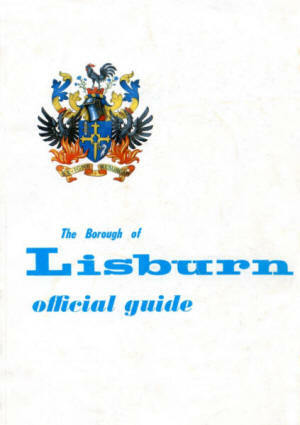 The town of Lisburn is the administrative, market, shopping, business, educational and recreational centre of the Borough to which it gives its name. It is a busy industrial centre standing on the River Lagan to the south of Belfast, on the main rail route from that city and at the junction of the Ml motorway with other main roads. Lisburn was the cradle of the Irish linen industry and this is still an important industry. The town was founded as a planned community by Sir Fulke Conway in 1609�it was then known as Lisnagarvey. In 1698 Louis Crommelin, a French Huguenot refugee, was appointed by William the Third to organise the linen industry. The growing town was destroyed in the war of 1641 and again in 1707 when an accidental fire destroyed almost the whole urban area including the cathedral and castle. Its revival after this great conflagration was helped greatly by the Huguenots and names of French origin are still fairly common in the district. It was a Lisburn linen merchant, Henry Munro, who led the United Irish insurgents in County Down � in 1798 he was hanged in the Market Square. Other famous figures of Lisburn's history were Sir Richard Wallace, who gave the world the famous Wallace art collection in London, and Nicholson of Delhi who played such a vital part in the Indian Mutiny. Nicholson, although born in Dublin, was brought up in Lisburn. Largely as a result of the fire of 1707 Lisburn has very few old buildings. The most interesting is Christ Church Cathedral (Church of Ireland) which is tucked away behind houses to the east of the Market Square. Originally built in 1623 (and a good example of 'Planters' Gothic) it was rebuilt in 1708 after the fire. The rather slim spire was added a century later in 1804. The original church was, in 1662, given cathedral status by Charles the Second when he raised the Rev. Jeremy Taylor to be Bishop of Down and Connor as a reward for his services in the Royalist cause. Bishop Taylor died in Lisburn in 1667 and was buried in Dromore Cathedral. Prominent in the Market Square is a bronze statue of General Nicholson (Nicholson of Delhi) who is shown with a pistol in one hand and a sword in the other. The statue was the work of F.W. Pomeroy R.A. Also in the square are the Assembly Rooms which, with the domed clock tower and handsome interior, were rebuilt in 1708 after the fire. Of the former 17th century castle, another fire casualty, only a part of a gateway still stands in Castle Gardens on a slope between the cathedral and the river. Other buildings of interest include the First Presbyterian Church which is one of the oldest in Ireland � it was built in 1708 but a much earlier church had existed on a nearby site. In the Market Square stands the first house to be built after the Great Fire of 1707; another house in the square was the home of Henry Munro and now forming a part of the Technical College, is the house in which Sir Richard Wallace once lived. St. Patrick's Roman Catholic Church at Chapel Hill stands on the site of an earlier church of 1794. The interior is of lofty and dignified Romanesque style. Modern Lisburn's centre suffers from traffic and 'planning blight' problems but substantial redevelopment is scheduled. The first part of a through-pass road is complete and a second phase is well under way. The town centre has an excellent range of shops and the open-air market at Smithfield Square draws great crowds every Tuesday morning. Other amenities of Lisburn include the 25 acre and well wooded Wallace Park which was given to the town by Sir Richard Wallace. There is good fishing in nearby streams; the town has a modern indoor swimming pool and facilities for many outdoor & indoor sports and social activities. Long established though the linen industry is, the oldest activity of all in the Lisburn area is agriculture and many of today's industries are still based on the land. Close to the town is one of the country's largest factories for making animal feeding stuffs and there are also two farm by-products factories within the Borough. Other factories pack and export eggs, manufacture jam, can all kinds of fruits and vegetables, process poultry, and deal with other types of farm produce. Prominent among more modern industries are cabinet making, ball-bearing manufacture and motor car production. Modern furniture is made for home and overseas markets with several of the new plants working almost wholly on export orders. Ball-bearings are made almost entirely for export by a world-famous firm. Other new industries include the manufacture of tyre valves (by a large American-owned business); tape recorders; wire rope; clothing; pressure lamps and cookers; and life saving equipment. Development continues and other new industries are moving into the industrial estates on the town's perimeter. 1. Encourage new firms to start in business. 2. To help existing firms to survive and grow. 3. To Promote closer co-operation of development plans and industrial promotion programmes. A preliminary meeting of the new organisation has taken place and steps are being taken to place the new organisation on a firm basis.